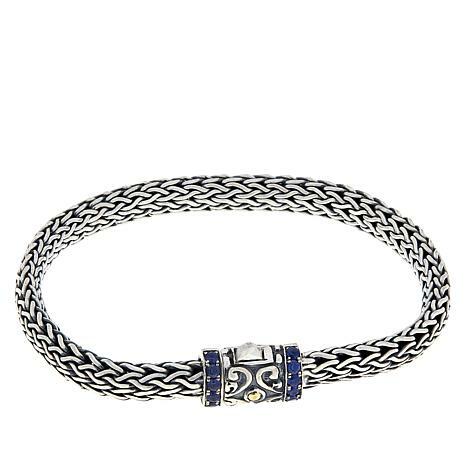 A timeless and classic design, this Tulang Naga woven bracelet is the perfect accessory for every wardrobe. Pavé-set gemstones make this outstanding accessory pop with a flash of color. 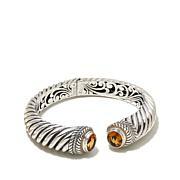 Featuring traditional Balinese scrollwork on the box clasp, along with a solid 18K gold accent, this bracelet will quickly become your favorite. 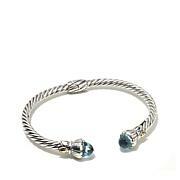 This bracelet is sized correctly (8inch) and the sapphires are the perfect blue, not dark. 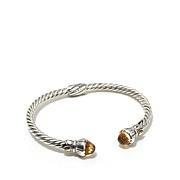 I have John Hardy and JAI and this bracelet is equal to both designers in beauty and strength and it looks perfect when I wear them all together. As soon as this one is paid off I plan on getting the pink sapphire to add to my collection. I've been wanting one of these bracelets for a long time. I saw the sapphire and had to have it. I recieved it yesterday and haven't taken it off since. At first I thought it was heavy however after wearing it I can say it isn't. I even slept with it on. Honestly I forget I have it on because it is so comfortable. 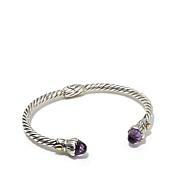 A beautiful well made bracelet. Buy one you will not be disappointed. In fact I'm thinking two would be great together! The blue of the stones is so beautiful, and the bracelet is probably the most comfortable bracelet that I own. I'm very happy with my purchase! I love this bracelet. It's beautiful. I had to return it because the closure was too difficult to close. I tried for 20 minutes on both arms, to no avail. I am so disappointed. I'm afraid if I ordered a larger size that the sapphires would end up at the bottom of my wrist. The gem is to small. So essentially I am buying it for the bracelet, which I didn't like.